Amber, the one real world, wherein all others, including our own Earth, are but Shadows. Amber burns in Corwin's blood. Exiled on Shadow Earth for centuries, the prince is about to return to Amber to make a mad and desperate rush upon the throne. From Arden to the blood-slippery Stairway into the Sea, the air is electrified with the powers of Eric, Random, Bleys, Caine, and all the princes of Amber whom Corwin must overcome. Yet, his savage path is blocked and guarded by eerie structures beyond imagining; impossible realities forged by demonic assassins and staggering horrors to challenge the might of Corwin's superhuman fury. 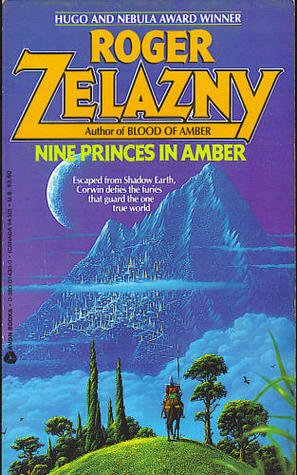 Voice is an important element in any novel, and it shows best in a first person POV such as Nine Princes in Amber. Here, the voice is the driving force behind it all. From the beginning, it sets the tone for the story and shows the personality of the main character. But one thing about voice is that it has to be consistent and appropriate for the setting, and Corwin’s voice wavers between these two. The story begins with Corwin, one of the Princes of Amber, who wakes up in a hospital suffering from amnesia. Any other person would be freaking out, but Corwin is cool and collected. He deduces something is wrong and immediately sets on a plan of escape. Corwin is ruthless—“I’d get what I needed and take what I wanted, and I’d remember those who helped me and step on the rest” (33)—and doesn’t care that people don’t like him—“Somehow, the feeling pleased me” (21). His voice is over-the-top and humorous, and his actions paint him as an act first-second-and-always kind of man. In just a few pages, we get a sense of who Corwin is because his voice is so distinctive and strong, but it doesn’t stay that way through the whole novel. There are two main aspects to Corwin’s voice. And uses popular phrases. It’s Corwin’s expressions that jar the narrative in more than one occasion. Even with his cocky voice and popular speech, these phrases come off as too modern for the setting, be it Shadow Earth or Amber. The first five chapters have these expressions peppered throughout: “still sacking Z’s” (5), “One helluva one” (6), “thrown a monkey wrench into her plans” (35), “let’s get rolling” (52), “Get the picture?” (62). Each one is far enough apart not to be Corwin’s ‘usual’ voice and therefore we trip over them while reading. They don’t feel as part of the story, but rather like forced inclusions in the narrative. Then later on, when he explains his recovery, and he says, “Well, let’s take it like this: I had awakened in a hospital bed and learned that I had recovered all too soon. Dig?” (158). Though Corwin is modern enough to use these popular references and expressions, they don’t feel right when compared to the rest of the world and the voices of the other characters. And in a monotone retelling of events. His previous fiery deliveries are gone and the chapters feel more fantasy-like because popular expressions disappear. It is only by the end chapters that confident and boastful Corwin returns, but thankfully not the popular expressions. Corwin’s voice acts as the driving force behind the story. He’s a character that begs to be followed if only to see what rash thing he’ll say or do next. But his expressions are jarring even with his modern speech and his voice inconsistent. One might attribute the sudden change in voice to character growth or change in setting—from Shadow Earth to Amber—but that isn’t the case as Corwin is still reckless and cocky in the end. Regardless of the changes in voice and trippy phrases, I quite enjoyed reading Corwin’s story as it is fast paced and full of random events.